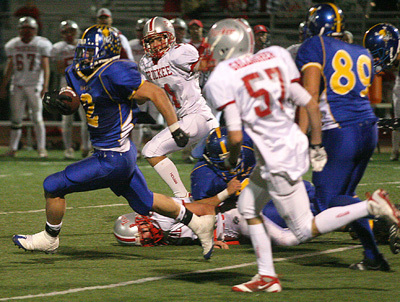 JIM MILLER/LAS VEGASREVIEW-JOURNAL Moapa Valley running Back Brad Weiss carries the ball against Truckee (Calif.) in the Class 3A state title game on Saturday at Arbor View. Weiss rushed for 127 yards and three TDs in the Pirates' 35-16 win. Moapa Valley football coach Brent Lewis thought he could dodge an icy Gatorade shower by dumping the bucket in the final minutes Saturday night. Pirates defensive tackle Tyler Lomprey had other plans. Lomprey led a handful of teammates in filling a new bucket and splashing it over Lewis’ head. Moapa Valley then charged the field, flinging its helmets in the air in a raucous celebration of a 35-16 win over Truckee (Calif.) in the Class 3A state title game at Arbor View High School. The Pirates’ second straight Class 3A championship gives Moapa Valley (10-2) 15 football titles overall, which ranks third in state history. It’s the first time the Pirates have repeated since taking three consecutive 1A crowns from 1966 to 1968. “We all love Lewis so much,” Lomprey said. “He helps us all the time, and we couldn’t do it without him. The Pirates did it by outgunning Truckee in the first half before imposing their style of play — a grind-it-out game — in the second. The teams combined for 396 yards of offense in the first half, including 253 in the opening quarter. They traded touchdowns on opening drives before Moapa Valley surged ahead 21-7 with first-quarter TD runs of 17 and 2 yards by Brad Weiss. After going to halftime up 35-16, the Pirates held the Wolverines (9-3) to 113 yards in the second half. “We’re a defensive team,” Lomprey said. “We like to play defense. We just stepped up in the second half and didn’t give up big plays any more. Those two big plays, 88- and 50-yard touchdown runs by Ryan MacKen and Jordan Deiro, accounted for 138 of Truckee’s 171 first-half yards. 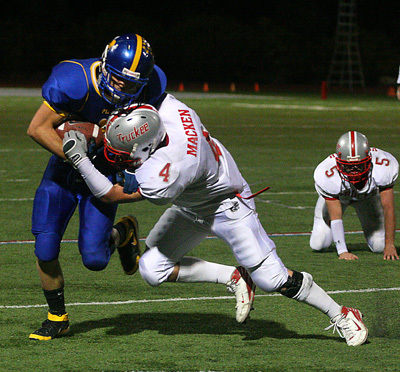 Weiss carried 20 times for 127 yards and three touchdowns to lead the Pirates. The senior running back set a single-season school record with 1,815 yards rushing this season. He also picked off a pass while playing defensive back. Moapa Valley quarterback Max Jenkins completed 5 of 10 passes for 108 yards and two touchdowns. Matt Newton hauled in four of those passes for 105 yards and both scores. Moapa Valley has gone from 3-7 in 2005 to two-time defending state champion in 2008. Since the Nevada Interscholastic Activities Association went to four classes in 1996, the only other 3A teams to repeat are Bishop Manogue (2002-03) and Truckee (2004-05).